Longview Solutions provides tax departments with a full suite of tax software to manage direct (income) taxes. This includes tax provision and reporting, tax analysis and planning as well as operational transfer pricing and country-by-country (CbC) reporting. A dedicated tax application suite speeds the tax process, enhances control, reduces the chance of errors and ensures consistency in provision, reporting, analysis and planning. The need for direct tax software has grown over the past decade. Tax department workloads have increased as statutory accounting and tax authority reporting requirements have become more demanding. Today there are more rigorous requirements for accounting for uncertain tax provisions, for example; also, tax authorities demand greater tax transparency, especially on the part of multinational companies. In response, corporate boards and senior executives are demanding greater visibility into direct tax provision to be able to oversee the process more closely and plan more effectively to minimize tax expense and exposures while mitigating tax risks. This is especially true for publicly-held companies. 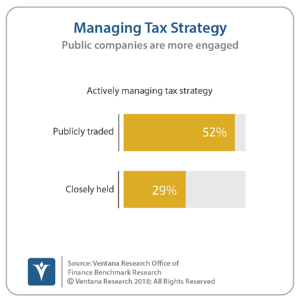 Our Office of Finance benchmark research finds that 52 percent of public corporations actively manage tax strategies compared to 29 percent of closely held ones. Fortunately, the technology available to address the stringent demands of tax departments has matured to the point where it is practical and affordable. ensures data integrity and accuracy. There is a single version of the truth and all formulas are correct and consistent. accelerates accurate and consistent data collection and management. can substantially reduce the amount of time it takes to prepare taxes because all the data used in calculations is easily retrieved from a single data store, so there are no spreadsheets to roll up into a consolidated data set. facilitates audit defense because a dedicated application saves all the data, formulas, calculations and notes as they existed in the provision process. Where the data is sourced from also matters. Most companies will find that they can achieve a consistently high degree of accuracy, auditability and visibility by having their tax provision application share the same data used by their financial consolidation and reporting system. Using the same data ensures that the data used in the tax provision process is always reliable and up-to-date. Moreover, tax professionals spend far less time checking the accuracy of the data and calculation, which speeds up the tax provision process and therefore can shorten the accounting close. Using a dedicated application saves the time of tax professionals who currently rely on spreadsheets to manage their tax provision process. 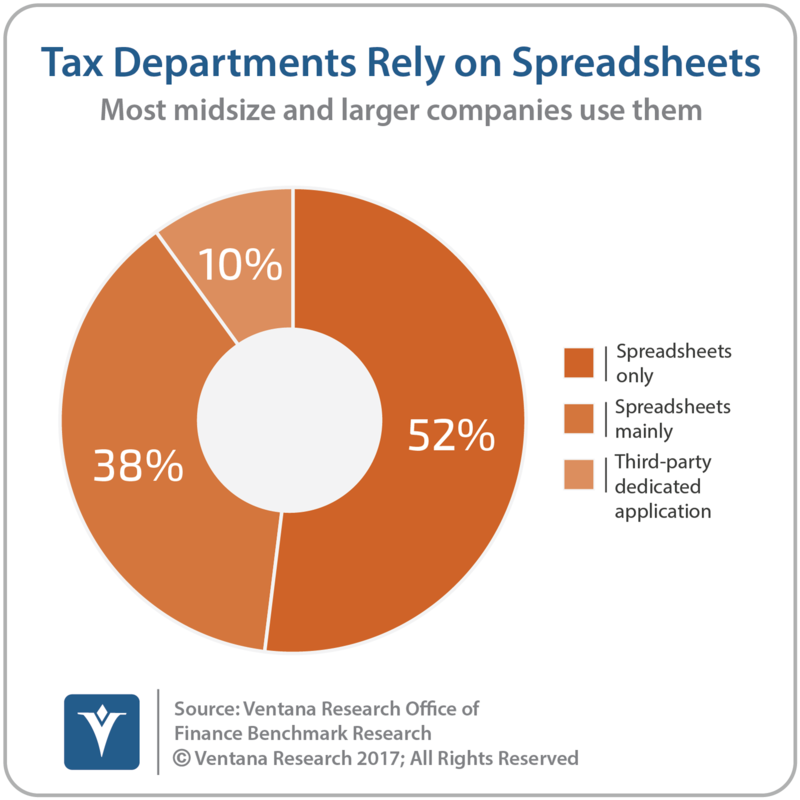 Our research shows that most organizations use spreadsheets to manage their tax provision and analysis: Half (52%) rely solely on spreadsheets, and another 38 percent mainly use them. A dedicated application saves time that can be used for analysis and planning aimed at lowering tax outlays. Today, only 12 percent of companies use tax analytics extensively. Tax professionals also can use this time to do what-if scenario planning that simulates possible outcomes and helps guide strategic decision making across the organization. Spreadsheets may have been the only practical alternative at one time, but today they aren’t the right tool to use for tax provision. Earlier I noted that new country-by-country reporting is a challenge to tax departments. The mandated country-by-country reporting requirements put a premium on consistency. Especially in companies where tax reporting is decentralized, a dedicated tax provision application ensures consistency because tax data isn’t siloed and therefore is readily accessible. Having a single source of data and the analytics to assess tax data can help senior executives anticipate where there might be perceived issues related to taxes paid. This awareness can help guide tax-related decisions and help prepare a company to respond to any challenges. Longview Tax also supports transfer price management. The term transfer price relates to how corporations price transactions within and between legal entities under common ownership. Companies have an incentive to structure transfer prices to shift profits away from high-tax-rate jurisdictions to ones with lower rates. Because of the potential for abuse, tax authorities scrutinize cross-jurisdiction and cross-border transactions and challenge intracompany transfer prices that appear abusive. Thus, organizations must have controls in place to ensure their transfer pricing is defensible and only as aggressive as senior executives allow. Having consistent, reliable data and a system that scales to handle a company’s volume of transactions enables pricing management that has this sort of consistency and control. The corporate tax environment is increasingly difficult and consequently tax departments are facing challenges that put a premium on both speed and accuracy. Executives and boards of directors are demanding greater internal tax transparency. A dedicated tax provision application will help tax departments improve their performance and address both existing challenges and those to come. 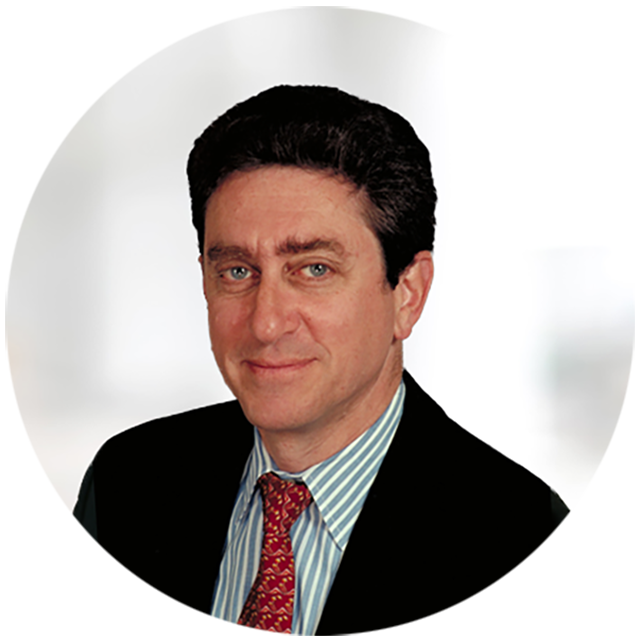 I recommend that CFOs and tax departments assess the value of using dedicated software to enhance the quality and efficiency of their tax processes. I also recommend evaluating Longview Tax as part of this process.